Editor's Note: Brian Culley ran for Norwell High School (MA) before any of the current Foot Locker participants were born. He can be reached at [email protected]. 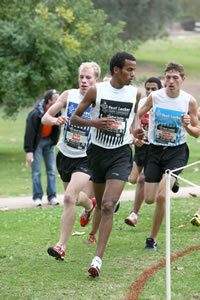 Coming in to the Foot Locker Boys Cross Country Championships, Solomon Haile had never lost a cross country race. His streak continues. The best plan for a favorite in a deep field is typically to go out fast enough to be clear of any shoving, but to allow the early leaders to do the lion�s share of the initial work. Haile didn�t have to study the plan too hard, because that was exactly the tactic he used. Passing through the first kilometer, Haile was among a large pack, including seniors Chris Schwartz (CA) and Evan Appel (CO). The fat pack hit the mile in 4:45 and even 39th place (out of 40) was in theoretical contention at 4:55. Coming off the first hill and just shy of 1.5 miles, the boys began to string out. Haile took himself a stride ahead of Trevor Dunbar, a sentimental favorite out of Alaska, and Thomas Porter from Virginia, as well as three other challengers. As is sometimes the case in distance running, the drama was fairly subdued. At 2.2 miles, Solomon had opened up a 10 meter lead on Dunbar, who had himself gained 10 meters on Porter, who had 10 more on Czech Republic exchange student Jakub Zivec. Interestingly, Zivec nearly scratched from the event. He had injured himself at a prior meet. �My goal was just to finish,� he remarked, smiling broadly, �It [my foot] was very painful. I wanted to give up, but the crowd.� His comment hung in the air, requiring no further explanation. Repose? Yep, most of these kids aren�t just national-caliber athletes; they also have absurdly high GPAs and manage to have plenty of time for charitable or other extracurricular activities. It�s an impressive group of young men and women. Five seconds behind Dunbar, Porter and Zivec were still cracking elbows. The duo was side by side at the final turn with 100m left, but Zivic was edged ahead in the penultimate 50m. Porter recalled, �My dad was there at the road. Our team�s slogan is �leave no doubt� so I tried to focus on that, and if I die, I die, but I had to give it my all.� The inspiration paid off, as Porter found the source for a surge and not only passed Zivec back, but also held off a surprise charge from Drew Shields (IN). But this day clearly belonged to Solomon Haile, who didn�t seem quite ready to relinquish the microphone during the winner�s circle interview. But it wasn�t pride which kept him speaking, it was a genuine desire to show the crowd how much he enjoyed and appreciated the entire Foot Locker experience. �I�m so happy. I�m so excited.� He continued. And with good reason.